Finished - power and lights working! Last week we looked at the lighting systems being used in the workshop. This week it’s time for power. It’s one of those things that sounds pretty simple – where in a workshop to put the power points. However, if you want the best outcome, it’s anything but simple. For example, many people distribute the power points evenly around the periphery, eg in a shed putting one double power point in each bay. 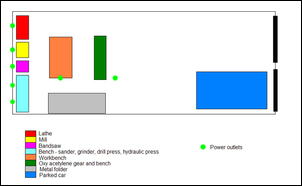 But that assumes that the requirement for power is also spread evenly throughout the workshop. And that’s not normally the case. In fact, before you can know where to position the power points, you need to have a good idea of how the workshop will be organised. As can be seen, across the back wall of the shed (ie, the far wall as you enter through the roller doors on the right) there are: lathe, mill, bandsaw, and a bench housing a sander, grinder, drill press and hydraulic press. Furthermore (and not shown on the diagram), tucked below the bench is an air compressor. Therefore, just across the shortest wall, there are seven machines requiring power. Clearly, lots of power outlets are needed here! But you can go one step further. Both the mill and the lathe may well need a second power outlet for each machine. 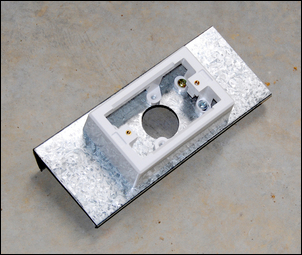 For example, each might need a suds pump to circulate coolant over the item being machined. Each might also need a dedicated work light. So it makes sense to provide both the lathe and the mill with double power outlets. The bandsaw, grinder, sander, drill press and compressor are most likely to need one power outlet each – so that’s two-and-half doubles. So, leaving one spare outlet, that adds another three doubles. Put these power outlets on the diagram (each green dot a switched double power point) and the distribution looks like this. But hell, go on at this rate and the workshop will have something like 25 power points! That’s far more than is needed, so let’s apply the same logic we did to the first section of the workshop – what power-using activities will be taking place? Certainly, the island workbench will be a hive of power use. An angle grinder, jig-saw, portable electric drill and other electric hand tools will be often used. Rather interestingly, each of these tools can also easily cut or penetrate power cables, so here another aspect needs to be considered – safety. By far the safest way of getting power to a bench is by means of a hanging power socket. By plugging into a socket located above your head, cords no longer need to run across the floor and the workbench itself. So we can add a hanging power socket located above one end of the workbench. We can also put in another hanging power socket, along the same plane but located closer to the centre of the workshop. Remember, these are above head height so don’t intrude at all. About this stage I physically stood in the near empty workshop, muttering to myself and pretending to do jobs. “OK, I need to make a bracket. I’ll cut it out with the bandsaw, smooth the edges with the belt sander, drill some holes in it with the drill-press. Er, but where’s the power outlet for the radio? There isn’t one! Something as simple as that – a radio needs its own power outlet within easy reach of the workbench. Ditto for a cooling fan. Here the extra power outlet has been added. Time for more talking to myself. “Ok, now I’ll install the bracket under the bonnet. Bring the car in and park it at a slight angle to enhance access. Here another three double power outlets have been added. The one nearest the roller doors will be mounted adjacent to the switchboard, near the light switches and another special power outlet I’ll come to in a minute. As can be seen, the north-east part of the shed is being designated as the ‘car working’ area. So what about power outlets on the southern wall? I think only one double will be needed. The grey object, the pan brake metal folder, weighs a huge amount so once it’s in place, it’s very unlikely to be ever moved. Let’s add them up. 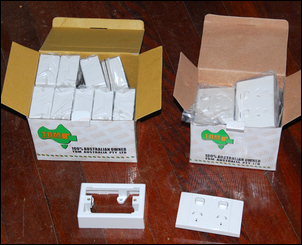 The wall-mounted power points comprise 10 doubles – a good number, as power points can be bought in bulk in packets of ten. In addition, there are two hanging single power outlets at the ‘working’ end of the workshop. In case I need power outside the workshop, there’s a power outlet close to the doors, and there’s a ‘surplus’ power point near the workbench for a radio or fan. The permanently installed power tools each have power access, and power tools that will be rolled into position for relatively rare use (eg power hacksaw, friction cut-off saw, wood-cutting saw bench) can use the hanging power outlets or those on the north wall. Handheld power tools being used on cars can also use the north wall power outlets (three doubles in this area), the single southern wall double or the single hanging nearest to the workshop centre. And there’s another, special, power outlet I want installed next to the switchboard. It’s a high current power outlet. Most power outlets in Australia are rated at 10 amps but you can also buy power outlets capable of much higher currents. How high then? 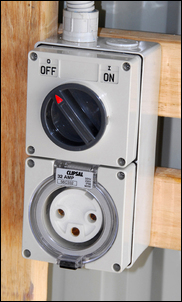 Well, without going to a three-phase power system, you can have a 32 amp power outlet, a design that has a uniquely configured socket and plug. I started buying the power outlets many months before the shed was built. Using eBay, a packet of ten double power outlets was bought for AUD$55 and ten deep mounting blocks for $19. These prices are way under half what my local hardware store charges - and the goods were brand new. To form the mounting plates for the power points, galvanised sheets were cut and folded so they would clip around the top-hat shape girts (longitudinal wall beams). These plates were then pop riveted into position. 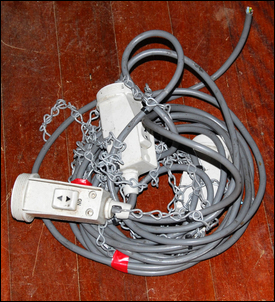 The hanging power outlets (three were bought although only two were used) cost about $30, complete with hanging chains. These were a second-hand eBay buy. As covered last week in Part 6. I also bought on eBay the surface mount sockets for the metal halide lights. But it wasn’t until I started to get quotes for the electrical work that I realised that I’d be buying nearly everything in the way of hardware! Remember, all the power points and lights were already supplied and mounted, and the trench would be pre-dug. The first quote was $2200, but that included the supply of the 32 amp power outlet ($300!) and a plug to suit it ($140!). 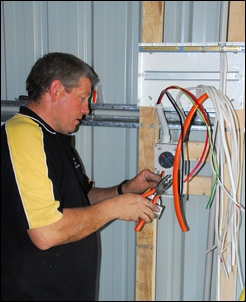 The switchboard, cable, conduit, main switches and some of the circuit breakers were also to be supplied by this electrician. After I lifted myself off the floor, I consulted eBay to find a 3-pin 32 amp power outlet (good brand, secondhand but in near new condition) for $58 including postage. I don’t have an immediate need for a plug to suit this socket, so that knocked $382 off the $2200 quote. 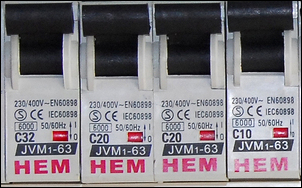 I then went chasing circuit breakers, to find that they’re available brand new on eBay for $3 each – no mis-print! I didn’t have these individually priced from the electrician but I can’t imagine that they’d be anything like this price if supplied. 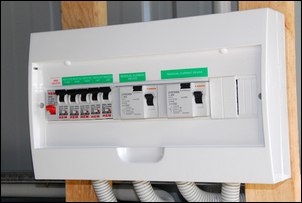 Four-pole RCDs (safety switches) were only $25 each! So when the next electrician came to quote, I said I’d be supplying everything but the switchboard, conduit and cable. His quote was $1650. The next electrician, despite having nearly everything supplied, said that it would take two blokes two full days – and so the bill would be $2200. After I was resuscitated, I asked if I could run the wiring in the workshop and they could just do the connections. That was OK but the bill would still be $1500. This didn’t make a lot of sense. One electrician had said it would take 12 hours using one bloke, another said it would take 16 hours with two blokes – WTF? One guy was quoting $2200 supplying nearly everything, and another was quoting $2200 but supplying only the cable, bare switchboard and conduit. I am not begrudging someone earning a decent rate of pay for the job they do. So to get a feel for the job, I totted-up how long I thought it would take me to do it, if I knew my way around switchboards and – more importantly – if I was legally allowed to do it. Clearly – clearly – the quote that said it would take two men two full days (ie 32 person-hours!) was just crazy, and the quote that budgeted 12 person-hours was about right. As with the price of the shed itself (see Building a Home Workshop, Part 1), it sure pays to shop around and to do absolutely as much as possible yourself! So what electrical parts did I need to buy and how much were they? After discussion with the electrician, here was my additional shopping list (remember, cable and conduit were being supplied by the electrician). These components were all bought from the one eBay supplier – the same firm that had already supplied the power points, metal halide light surface mount sockets, and the power point mounting blocks. The bill for the above listed components was just $140, including postage. I watched every step of the way Steve the electrician worked – not because I wanted to check up on him, but because I wanted to learn. And to be honest, nearly all the wiring was very simple - and that which wasn’t simple, could be understood after a few minutes of explanation. I’d suggest that anyone who can find their way around the engine management wiring of a car could, after a day of instruction, safely wire a shed – and after a week of instruction, be able to do it just about with their eyes shut. 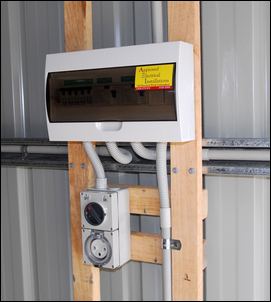 However, here in Australia – and especially in the state of Queensland – it’s illegal to do any mains power electrical work without the appropriate licenses. So I got to sit around and watch Steve wield his screwdriver. That’s not quite true, because I had to dig the trench (probably the hardest work in building the whole workshop!) and run a cable. As you’d expect, having proper power points in the workshop, and being able to switch on the two lighting systems, made an immediate and radical difference to the ‘completeness’ of the space. It also meant that full-on attention could be given to organising storage – and getting the machinery into the workshop.